State Department Bans Travel To North Korea On U.S. Passports Starting Sept. 1 : The Two-Way Americans currently in North Korea were told to depart by the end of August. Journalists and aid workers may apply for exemptions from the ban. Tourists bow before statues of late North Korean leaders Kim Il-Sung (left) and Kim Jong-Il, in Pyongyang last month. The U.S. will ban travel to North Korea starting Sept. 1. A U.S. passport will only get you into North Korea for the rest of August, the State Department announced Wednesday. In a notice posted to the federal register, the State Department said beginning September 1 U.S. passports will be invalid for travel to or within North Korea, with rare exceptions possibly granted to journalists and aid workers. The new rule will also apply to those currently in the country on U.S. passports; they were advised to depart in the next 30 days. The State Department said the restriction is in response to "the serious risk to United States nationals of arrest and long-term detention." The notice served mostly to put an effective date on a ban announced last month by the U.S. government. 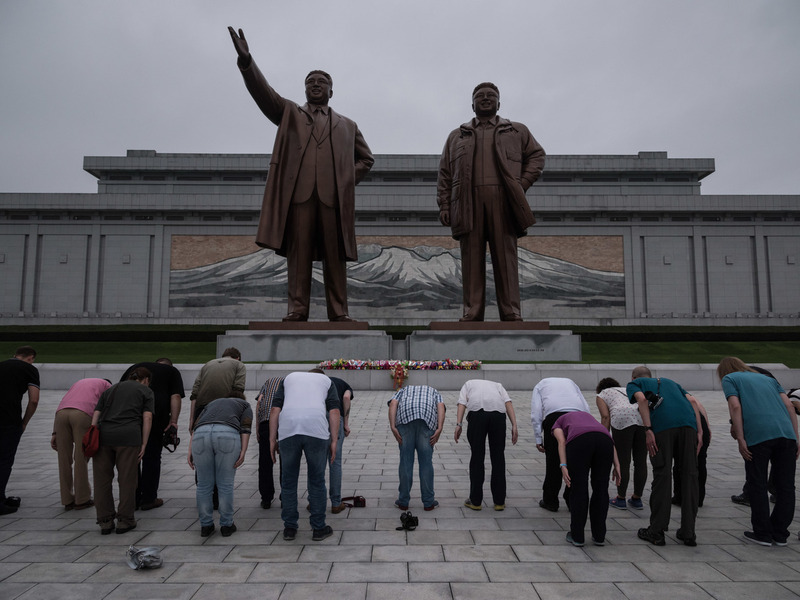 As NPR's Michele Kelemen reported at the time, the State Department's decision followed the death in June of Otto Wambier, a 22-year-old American who was visiting North Korea when authorities there arrested him. The North Korean government sentenced Warmbier, a student at the University of Virginia, to 15 years of hard labor for allegedly trying to "steal a propaganda poster." In June of this year, North Korea revealed to American officials and Warmbier's parents that his health had seriously deteriorated. He was sent back to the U.S. on June 13 comatose. He died six days later. North Korea called his death a "mystery." Doctors in the U.S. who examined Warmbier's brain said it had sustained "extensive loss of tissue," though they said they saw no obvious indications of trauma. A State Department official, Susan Thornton, in a call with reporters Wednesday, said Secretary of State Rex Tillerson plans this weekend to push China and other Asian nations during meetings in Manila to do more to isolate North Korea. "We have seen significant steps taken by China to increase pressure on North Korea," said Thornton. But, she continued, "we think that they can do a lot more."